Roncal Cheese is a delicious cheese made from sheep's milk that has 50% fat, made in the Roncal valley on the banks of Esca River in the Navarre Pyrenees (Spain). Its bark is strong between yellow and brown, the mass is ivory white and its consistency is compact, hard and porous. Its strong flavor is delicate and tasty, slightly spicy and buttery. It is a cheese with scents of hay, nuts and mushrooms. Roasted peppers stuffed with Roncal Cheese is a good meal to serve with a wine from Ribera del Duero. Roncal Cheeses are those that are protected by the Designation of Origin Roncal, which requires a rigid protocol in the elaboration process, as well as in the selection of raw materials, guaranteeing the authenticity of the product and production methods, attached to the tradition of the place. Roncal cheese was the first to receive the PDO for Cheese from Spain (1981) and defends a quality product with its own name against the avalanche of other types of cheese with perhaps a more aggressive market approach but with lower purity. Roncal cheese has a cylindrical shape, with 18 cm in diameter, flat sides and a height of about 10 cm, being admitted dimensions between 8 and 12 cm. It is ivory white, slightly pale yellow with a mighty taste, sharp, slightly spicy, very well defined and buttery on the palate. In its composition there are no elements outside milk, rennet and salt, so that has never lost its flavor and aroma. In addition, one of the requirements for its elaboration is that the milk has to be from sheeps of Lacha or Rasa breeds, from Navarra. 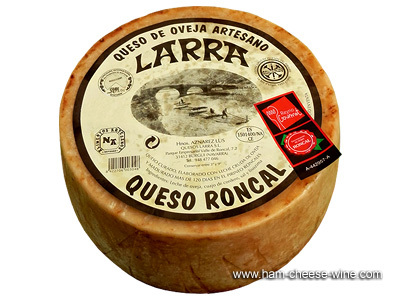 Roncal cheese is a pressed cheese made from sheep's milk containing no colostrum or medicinal products that might affect the elaboration, maturation or keeping of the cheese. The milk for the elaboration of Roncal cheese is whole and clean, no preservatives, with a balanced content of fats and proteins according to the characteristics of the breeds listed above and milking time, so that the final product has a fat content exceeding 45% of the dry matter. It will be kept at a temperature below 10° C to prevent microbial growth. 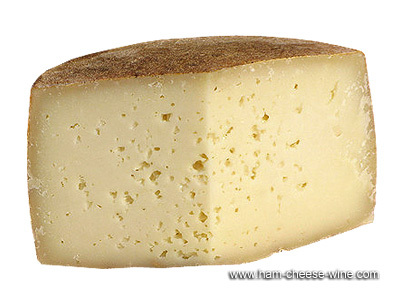 Roncal Cheese is a fatty cheese, with a minimum maturity time of four months, counted after the salting process. 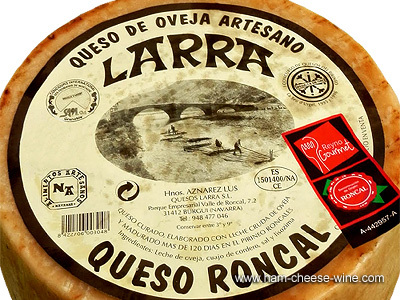 The area of elaboration and maturation of Roncal cheese is constituted by the municipalities of Uztarroz, lsaba, Urzainqui, Roncal, Garde, Vidangoz and Burgui, which make part of the Roncal Valley in Navarra. The production area of milk suitable for Roncal cheese includes natural areas of diffusion of Lacha and Rasa sheep breeds in Navarra.